I'm not fond of cooking. I'd rather be reading. But on the occasions when my always-efficient housekeeper, Azalea Berry, hasn't prepared something I can easily reheat in the oven, I can actually prepare a meal. I like recipes that are easy, ones that don't tax my limited imagination and abilities in the kitchen. Here's one of my favorites, and it's actually pretty healthy, I think. I've been told by a friend that I fail as a food photographer, but since I have no particular ambitions in that field, I don't mind. 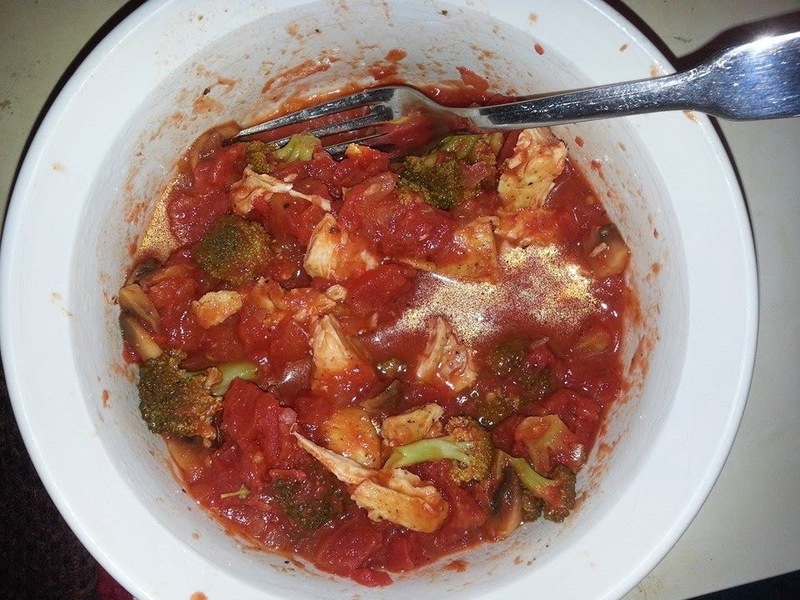 The basic ingredients for this dish are: chicken breasts, olive oil, salt and pepper, canned tomatoes, mushrooms, and broccoli. Cover the chicken breasts with olive oil, then sprinkle with salt and pepper on both sides. Grill until they're about 3/4 done. I use an electric skillet, which makes things fairly simple. Then add the canned tomatoes (1 breast = 1 can; 2-3 breasts = 3 cans, depending on how much broth you want). I use tomatoes that have spices added, like basil and oregano. Add the chopped mushrooms and broccoli (usually florets only). Add more pepper, to taste, stir, then cover and let it simmer for 15-20 minutes (until chicken is thoroughly cooked). Stir occasionally. This is a tasty concoction and easy to make. It also stores nicely in the refrigerator if you want to make a couple of meals out of it. I don't let Diesel have any, to his great chagrin, because of the spices (and because the tomatoes often have onion in them). A friend adds noodles to this, or you can serve it on noodles or even rice, if you like.